This is my favorite microwave dessert. Honestly, it's way better than Single-Serving Coffee Cake, although that was satisfying enough. Before microwaving: delicious egg-free batter. 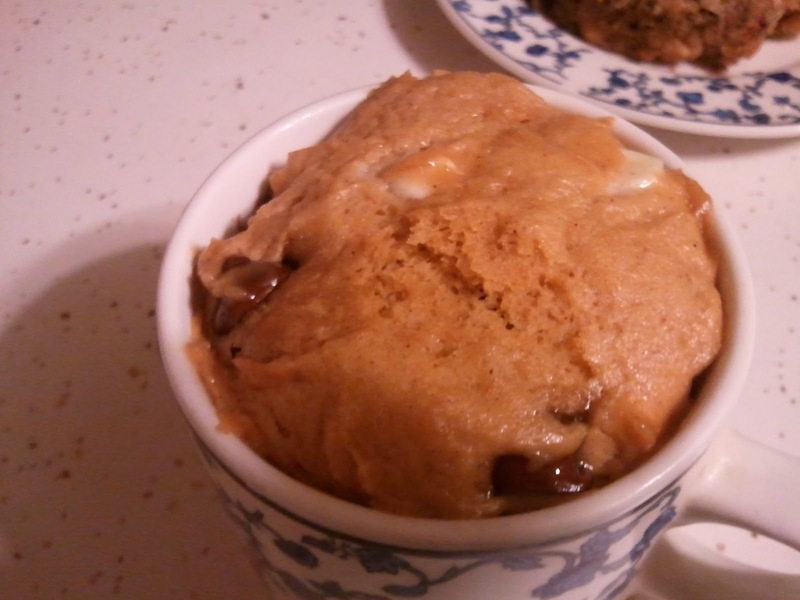 After microwaving: an addictive pumpkin muffin! Start with Vegan Pumpkin Cookies. 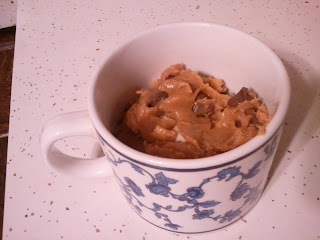 Add milk chocolate and white chocolate chips, making this no longer vegan. (If you are vegan, substitute or go chip-free.) Ghiradelli makes great versions of both chips. Microwave about 1/3 cup for a minute or so, until fluffy. This will expand a lot, so leave room in the cup or bowl. Here's a scaled-down version of the cookie recipe so you can make a small batch and microwave single servings as you like until it's all gone. Warning: that won't take long. 1. Blend all ingredients except chips. Then fold in chips. 2. Microwave about 1/3 cup batter for approximately one minute. 3. Let sit about a minute and eat. It will be steaming hot! Omg, these are amazing! It's dangerous how quick and easy it is to make these!